I will be posting the environments in the montage here. Will Continue to update with other montage pics as needed. Not at the quality I would like it to be, but apparently running short of time. Whoa, this is gorgeous. I personally like the more saturated version better, but I don't know what kind of color schemes we're going with for the rest of the film, so when we figure that out, I guess we'll pick which ones fits better. I do agree, I like the saturated version more, but only concern I have is the saturation may divert attention from the focal point (which is why I have two versions, just in case), which in this case would most likely be the knight. Hmm, that's true :/ I guess we'll know better after we test it out. I do like the saturated version better, but you are right. We won't if it's distracting until we try. IMO we should go with the more saturated version: this sequence will last about 10-15 seconds, and if all the emphasis is put on the Knight riding, it will be boring. Plus if we make the horse go on that bridge, it will be small, which will make the viewer feel like the journey is long and adventurous, which is good, and even better if the backgrounds are beautiful! will it look right if there's an animated rider and still background? yes most likely, since it should be understood that the montage and the horse riding will be in different "dimensions". 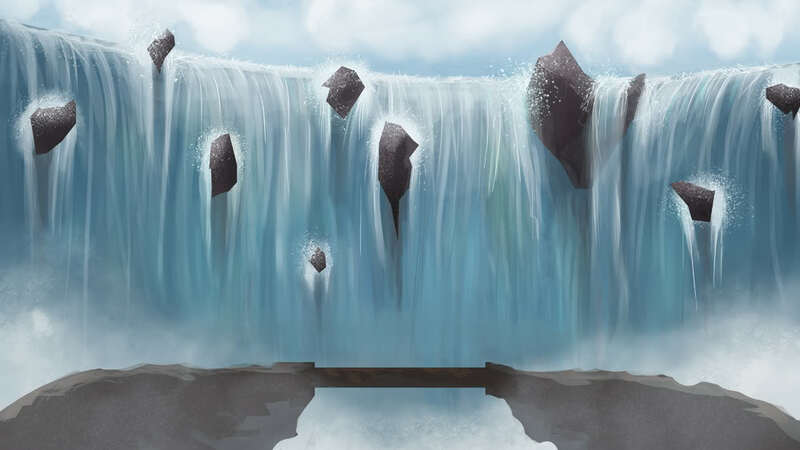 Only when the character is interacting with the environment would we need to have the waterfall/clouds moving. Updated with the forest one. Kinda rushed that one out tonight so its not at the level I'd like it to be. If I have time I'll make it a bit better. I like the more saturated for water but less saturated for forest. The water would have bright sunshine playing on it, but the forest is more shady. Updated with the giant crab. Will rework the Forest sometime tomorrow. I think the legs of the crab could be brought out just a little bit more. lol at the crab. XD nice! if we use any of the saturated ones we should definitely go with that one. Goes with the cell-shaded, wind waker style as well. I didn't realize this until today, but we need to make sure that these 2d backgrounds fit in with the toonshaded 3d backgrounds, so it doesn't look like a weird sudden jump. Caitlin mentioned that it's a montage, so some difference will probably be ok, but I think to make things mesh more, some black outlines should probably be put around some of the objects in these backgrounds. And also, everything with the toonshaders on comes out really bright, so we might end up wanting to go with the more saturated versions. Easy fix, at least the black outline part, I'll get to it if need be.  I think it would help everything look more cohesive. Everything else should probably be fine? I think? I guess we'll see when all the 3d backgrounds are finished. I posted a test of the montage in the dropbox, under animation. It's called "montageTest1.swf". Check it out, let me know what you think. I used the more saturated of the water falls picture Joon drew. I saw it in class and it looked really nice! I liked the look of the saturated colors behind the character. 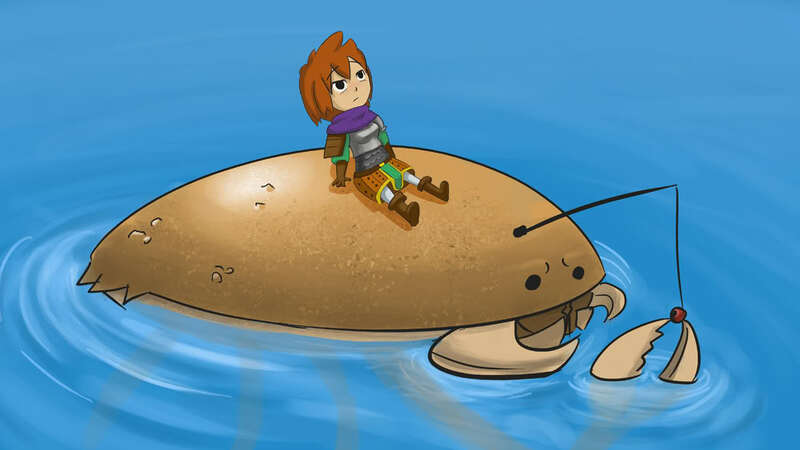 Updated the crab picture with the knight. Really big version is up on dropbox to prevent loss of resolution during zoom in scene. 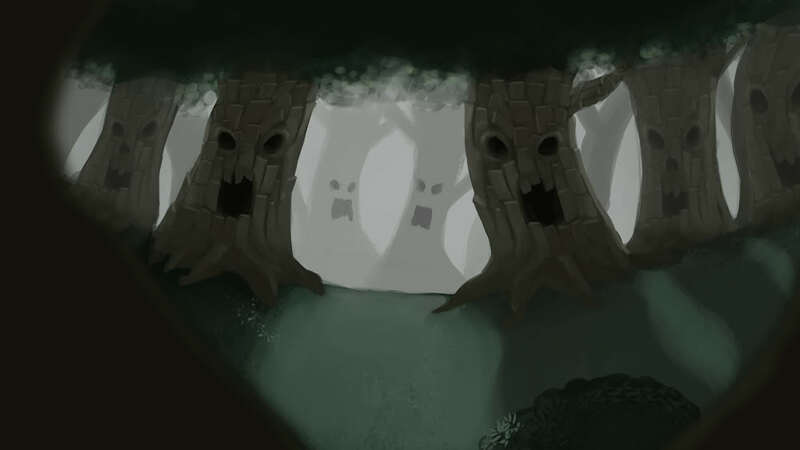 Updated the forest with a scarier version upon Max's request.